The City of Santa Clarita welcomes business and strives to make the process of doing business within the City as simple as possible. 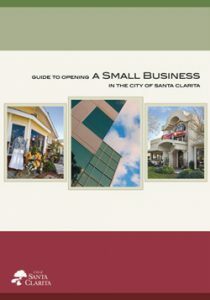 The Guide to Opening a Small Business was designed to help you successfully open a small business in the City and encompasses federal, state, county, and city regulations and requirements. The City does not issue nor require business licenses or business permits for businesses operating in Santa Clarita. A business permit is only required if the business is subject to Los Angeles County health or safety regulations. To inquire about a business license, please contact Los Angeles County at (661) 253-7342. If you are planning a home-based business, please contact the City’s Planning Permit Center at (661) 255-4330 to inquire about a Home Occupation Permit. For more information and eligibility requirements, contact Building and Safety at (661) 255-4935. The City of Santa Clarita offers a one-stop Permit Center on the first floor of City Hall in Suite 140. The center offers one convenient location for residents and local businesses to jump-start their building processes in a simple step. The City’s Permit Center includes Planning, Building and Safety, and Engineering Services staff in one convenient location to assist customers. The AJCC works with local businesses offering a variety of services from pre-screening job seekers to customized recruitments at no-cost. Visit the AJCC at the College of the Canyons University center at 26455 Rockwell Canyon Rd., or call 661-799 WORK (9675). Facilitated by College of the Canyons, and in partnership with the City of Santa Clarita, the SBDC provides workshops, trainings, business management and consulting, and financial advice to start-up and growing businesses. Looking to help your business go green? The City of Santa Clarita offers several programs and resources to assist local businesses in sustaining a green-friendly commerce environment. To find out more about these programs and other useful information to increase your businesses’ sustainability, please visit GreenSantaClarita.com.